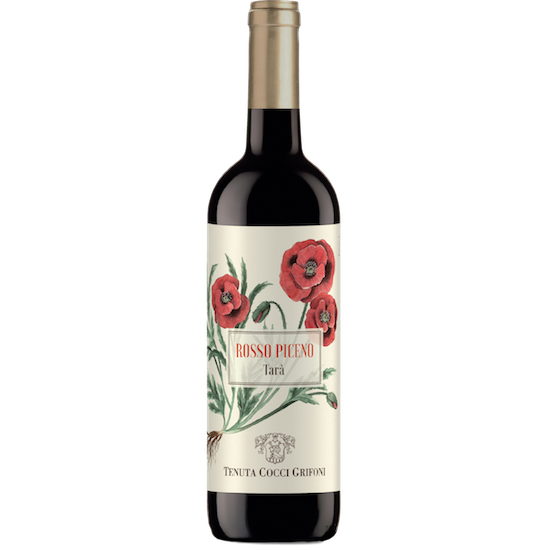 View Cart “Tenuta Cocci Grifoni ‘Tarà’ Rosso Piceno DOC 2017 [12/cs]” has been added to your cart. Cocci Grifoni’s Tarà estate operates under the Rosso Piceno DOC, a hilly landscape with breathtaking scenery dotted by medieval towns. The DOC covers an extensive area of the Marche region, and is dedicated to wines made largely from Montepulciano and Sangiovese. The Cocci Grifoni family’s vineyards here are between 20 and 30 years old. The vines grow in a remarkable natural habitat bounded by large canyon ravines and furrowed by deep gullies that join with the nearby Tronto River. The typical microclimate of these vineyards, interspersed with uncultivated tracts of woodland, are an ideal environment for viticulture. The cliffs shelter the vines from cold north winds, and the ravines collect rainwater for natural irrigation. The temperature swings considerably from day to night. The complex ecosystem generated by the unique geography hosts a range of animal and plant species typical of the Mediterranean, a region defined by its indigenous bio-diversity. Tenuta Cocci Grifoni was the first estate to bottle a Rosso Piceno in Le Marche. This estate bottling certainly does them justice. Produced since 1969, this wine is made of hand-harvested Sangiovese and Montepulciano grown in the clay soil of the Tarà estate vineyard. Fruit is gently crushed, then fermented in cool stainless steel. It rests four months in tank, then two months in bottle prior to release. Clear, transparent ruby in colour, the nose is shows red flowers and summer fruit: plums, cherries, and soft orange citrus. The palate is dry and fresh with balanced tannins.